Mike Ullery|Call Photo Piqua’s Brennan Toopes hauls in a touchdown pass on fourth down Friday night against Greenville. The annual contest for Toopes family bragging rights was a good one this week at Alexander Stadium/Purk Field. Brennan Toopes led the defense with six tackles and caught a fourth-down pass from quarterback Mick Karn for a touchdown. Owen Toopes caught two passes for 27 yards, had three tackles and had a 38-yard scoop-and-score on a fumble recovery for a touchdown. Grant Toopes was solid all game on the d-line all game in helping hold the Greenville rushing attack to 56 yards on 28 carries in the 42-7 Piqua victory. So, I will let them decide. After the opening game loss to Chaminade-Julienne and the Trotwood game looming on the schedule, not a lot of people expected Piqua to be 5-2 heading into a big GWOC North game at Vandalia-Butler this week. With Vandalia at 4-3 and ahead of Piqua in the computer ratings in D-III, Region 12, there is a lot at stake Friday night. And the Indians hope they can set the tone with more big plays like they did Friday night against Greenville. It started with quarterback Mick Karn, who rushed for almost 170 yards in the first half and finished with 188 yards on 16 carries. On Piqua’s first possession, Karn turned what looked like would be a short run into a 21-yard TD run. It appeared he would be stopped at the two, but he forced his way into the end zone. While, he lost the ball after crossing the plane, it was correctly ruled a touchdown. Piqua’s next score was set up by a 68-yard run by Karn to the Greenville one. Yet, Karn says he still can be better. Along with the big plays by the Toopes’ and Karn, was a big play by the Piqua secondary. Greenville’s Marcus Wood appeared to be headed for a long TD run when Zane Beougher stripped him at the Piqua two and Blane Ouhl recovered in the end zone for a touchback. Matt Blankenship also force a fumble recovered by Zayne Arbogast. Feeling Special: While Greenville’s only score was on a punt return by Wood, Piqua had some highlights on special teams as well. Trenton Foster had a 67-yard kickoff return and 27-yard punt return, while Ca’Ron Coleman had 41-yard kickoff return. Piqua also partially blocked a punt and Karn averaged 44.7 yards on three punts. “Other than that one play, our special teams was good,” Nees said. Solid D: Piqua limited Greenville to 159 yards and just seven first downs in the game. Jerell Lewis added five tackles to Brennan Toopes team-leading total, while Blankenship, Coleman and Makeegen Kuhn all had four. Seeing Yellow: For the fourth time this season, Piqua had at least 70 yards in penalties. The Indians followed a Sidney game with 94 yards in penalties, by being whistled nine times Friday night for 101 yards. 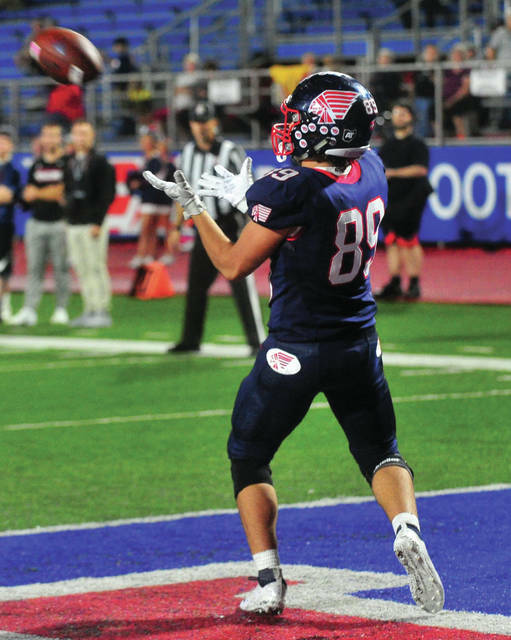 Piqua hopes that will change Friday night — when there will be another competition for bragging rights in the Toopes family. https://www.dailycall.com/wp-content/uploads/sites/30/2018/10/web1_100518mju_fb_phs_89-1.jpgMike Ullery|Call Photo Piqua’s Brennan Toopes hauls in a touchdown pass on fourth down Friday night against Greenville.